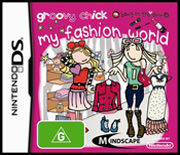 Targeting a much younger and gender specific target group, Groovy Chick My Fashion World by Mindscape is the latest children's game on the Nintendo DS which creates a virtual beauty salon. For girls who are into fashion, make-up and the like, Groovy Chick could be the perfect game for them as they perform a variety of mini-games, all in the name of fashion and looking good. Interestingly enough, the game even contains a story of the main character trying to find Prince Charming. How's that for cute? The story of Groovy Chick revolves around Fleur who has just opened a new beauty store and now she needs to start making money by catering for a variety of different customers. Including a large spectrum of clientele that include waitresses and actresses, Fleur must listen to their requests and through the gamers' own imagination and flair, they must pamper these women and make them look good. You also need to build in your boutique by dressing your clients and you even get scored on your technique by getting stars which assists Fleur in finding Mr. Right. In essence, the game revolves around a variety of mini-games that includes hairdressing, creating unique and suitable hairstyles for clients or our favourite, creating manicures for customers and best of all, the developers have included some of the unique controls of the DS into the game. Although the stylus is the main device used to interact with the gaming environment, the user needs to use the microphone and by blowing on the microphone, this helps with the nail polish to dry. Cool hey? Customers also have quite strange requests like asking to look good for the beach and you need to find them the appropriate hair cut and even wardrobe for the event. Another nifty feature is that the Nintendo DS must be held like a book while playing which in essence gives more real estate for the game's graphics. In terms of gameplay, the mini-games for older gamers would become a little repetitive as it's basically style, groom and select a wardrobe and then repeat these steps. With this in mind, the game wasn't trying to be clever but rather targeting a particular age and gender that needless to say, works quite well. In term's of graphics, Groovy Chick looks like it has been hand drawn and looks quite 2D at times, however with a varied colour palette. Even though the graphics look simplistic at times, it actually suits the game itself and looks like a kid's title. Where the game is lacking is through the music and sound that "sounds" quite un-inspirational and a little lackluster at the best of times.